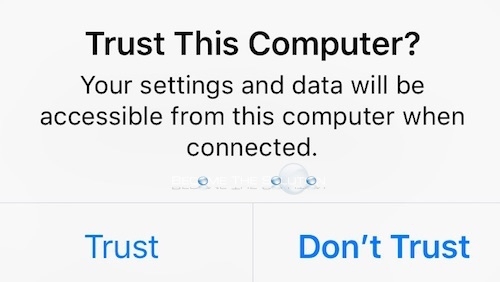 When you connect an iOS device your computer for the first time, you will receive a trust request prompt on the device. Your settings and data will be accessible form this computer when connected. If you decide to trust a computer, you will be able to sync and access your iOS device using iTunes and Image Capture (Mac). If you decide to not trust a computer, you will block access to the iOS device and the computer. Each subsequent time you connect your iOS device in this case, you will continue to see the trust alert prompt. Plug in your iOS device to a new computer. You will receive the Trust This Computer? message on your iOS device. Click Trust. 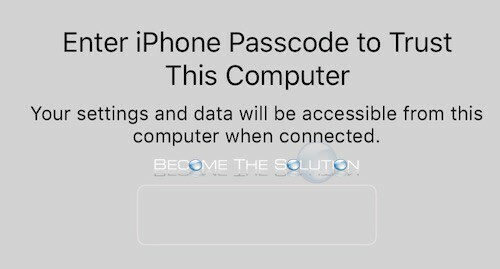 You may receive a prompt to enter your iOS device passcode in order to complete the Trust. If you decide to remove a trust from a computer, you must do so on your iOS device. Go to Settings -> General -> Reset -> Reset Location & Privacy.